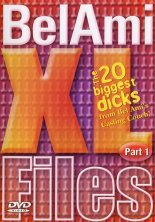 "The twenty biggest dicks from Bel Ami's casting couch!" for: the biggest collection of outrageously oversized dicks ever assembled into one film. Over the last several years Bel Ami's casting scouts uncovered many models with major meat, and we gave them all screen tests on our casting couches. Some of these super-endowed studs' casting auditions are being shown here commercially for the first time. The ones that have already appeared in the 101 Men series have been re-edited into longer versions. Sit far back from your video screen, because when these twenty horsecocks are hard, they could poke your eye out! We guarantee that all performers are 18 years of age or older, 9" or better, and are in the custody of George Duroy."